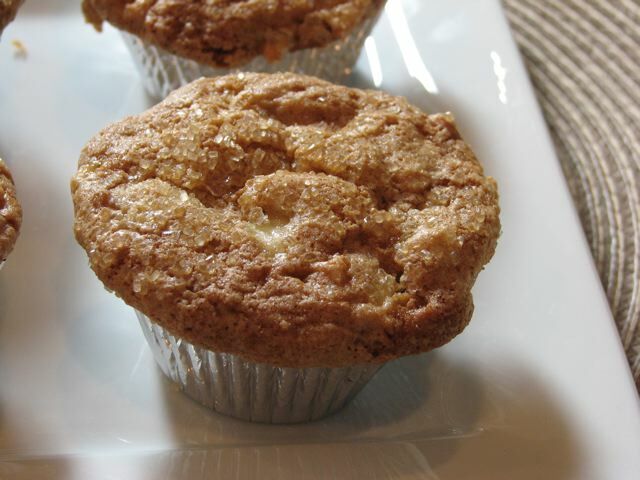 Butter & flour muffin tins or use paper liners. Fill muffin tins to the top. Sprinkle with brown sugar (or Sugar in the Raw). Bake at 350 degrees for 20-25 minutes. Makes 18-24 muffins. Categories: Baking, Baking - Bread, Breakfast, Favorite, Fruit | Tags: Apple, Apple Muffins, Apples, Breakfast, Muffins | Permalink. For my daughter’s birthday I made pancakes for breakfast. Combine the above ingredients. In a cast iron skillet over medium heat add a pat of butter and pour approximately 1/4 cup size batter in the prepared skillet. Add blueberries. I use canned blueberries — the brand I really like is: Oregon Fruit Products. The berries are huge – almost dime size! Allow to brown. Turn over with a spatula. Brown other side. Keep in a serving dish in the oven at 250 to keep warm until you have baked all of them. Serve with blueberry syrup, maple syrup and whipped cream — it was a birthday celebration after all! Enjoy! 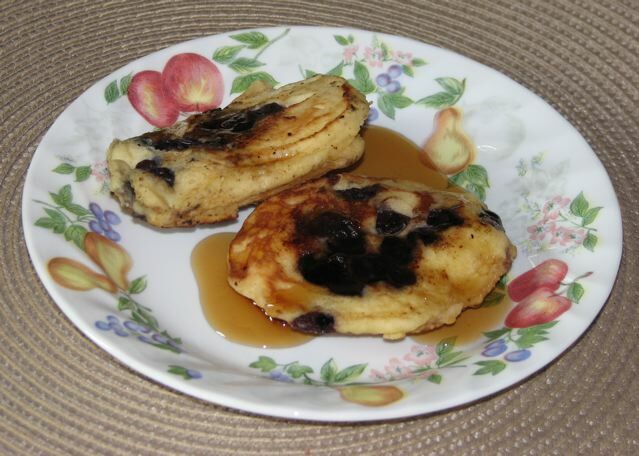 Categories: Breakfast, Fruit | Tags: blueberries, blueberry, blueberry pancakes, Food Blog, pancakes, Recipe | Permalink. Nothing screams comfort food to me more than lasagna. Something about it — I think it’s the carbs – call out my name and say “Eat ME!” My oldest daughter turns 13 this week and this was her requested Birthday meal – well, we started off with her favorite breakfast: blueberry pancakes, then had subway for lunch and lasagna for dinner. This is about the lasagna! One of my friends gave me the recipe for Spinach Lasagna. It has been a recipe in our family for about 15 years now. I like having meat in my lasagna, so now I make the same recipe but add a package of cooked mild Italian sausage to the mix. I use the Barilla brand noodles because they are flat, but you could use any pasta you want. The best part of this is: you DON’T have to COOK the pasta ahead. Just lay them down in the lasagna dry! Terrific and easy to make! Even easier to eat. It is a great way to sneak in those vegetables that the kids won’t go near, but when mixed with cheese and pasta they don’t seem to notice. Nan’s Spinach Lasagna – Nan P.
Mix 1 cup Mozzarella, ricotta, egg, spinach, garlic, spices together. In a greased 13x9x2 inch baking dish, layer 1/2 cup sauce, 1/3 of noodles, cheese (optional cooked sausage), Repeat with sauce, noodles, cheese, noodles, sauce. Top off with remaining cup of mozzarella cheese. Cover tightly with foil. Bake at 350° F for 1 hour 15 minutes. Let stand, covered, for 15 minutes before serving. 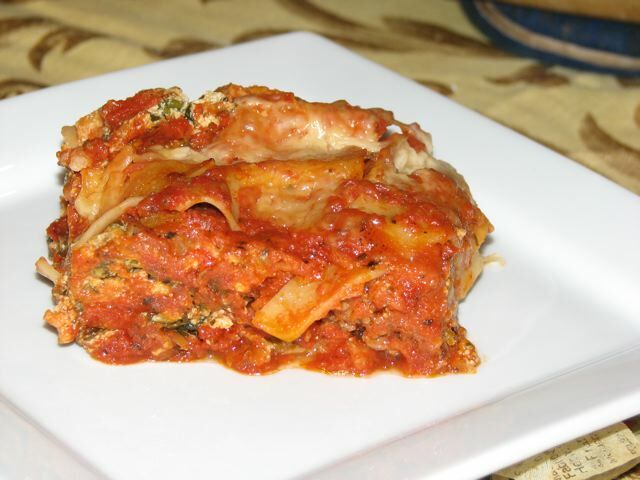 Categories: Ethnic, Ethnic - Italian, Main Dish, Main Dish - Pasta | Tags: Barilla lasagna noodles, Comfort Food, Food, lasagna, No Cook Lasagna, Recipes | Permalink. I don’t know about you, but I love the meatloaf at Boston Market! I think the name of the chain used to be Boston Chicken, but they changed the name in the 90’s. I always wanted to be able to make it at home. I don’t think it is spot on but it does come close! — I’ve had issues with the meatloaf falling apart on me in the past, though that has been less of a problem when I added an egg to the mixture for binding. Our family has nicknamed it “lumpy meatloaf” for the very reason that it does not keep its shape very well. But that is forgiven, because it does have a really good flavor! The recipe originates in one of the books by Todd Wilbur (Even More Top Secret Recipes: More Amazing Kitchen Clones of America’s Favorite Brand-name Foods). If you do not have the series of books, I think they are worth picking up. He has copycat recipes by common and popular food chains. For Sauce: Combine Tomato sauce, Barbecue sauce and sugar. in a small saucepan over medium heat. Heat the mixture until it begins to bubble, stirring often, then remove from heat. In a large bowl, add 1 cup of Tomato sauce to the meat. Use a large wooden spoon or your hands to work the sauce into the meat until it is well combined. Combine the remaining ingredients with the ground sirloin – flour, salt onion powder, ground pepper, and garlic powder. Use the wooden spoon or your hands to work the spices and flour into the meat. the pan and place into the oven for 30 minutes. After 30 minutes, take the meatloaf from the oven, remove the foil and if you aren’t using a meatloaf pan, drain the fat. 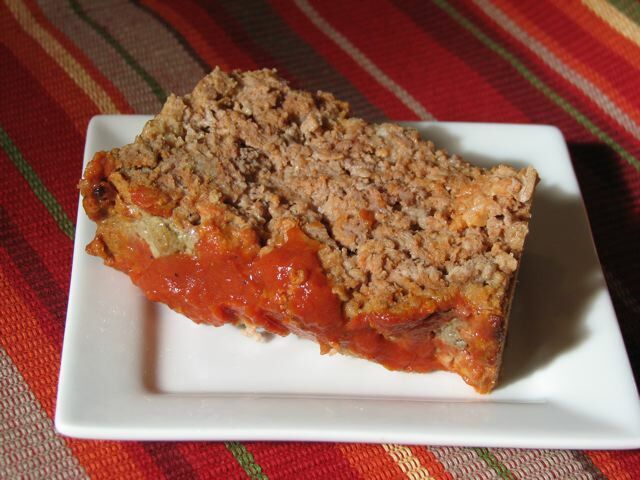 Place the meatloaf back into the oven, uncovered for 25-30 minutes or until it is done. Remove and allow it to cool for a few minutes before serving. Serve with remaining sauce. Changes I have made: add an egg. I doubled the sauce because I like to have extra on the side. You can vary the flavor by using various BBQ-sauces. Categories: Copycat recipe, Main Dish, Main Dish - Beef | Tags: Beef, Boston Market, Food, Food Blog, Meatloaf, Recipes | Permalink. My Aunt Helen is a wonderful cook. I had the honor of living with her and my Uncle briefly when I was in College and she would make these wonderful Strawberry Crepes for dessert. This was the summer that I met my husband. I still like to make these from time to time and now my children enjoy them too! Today I made them for breakfast. Grease a 6-7 inch non stick skillet lightly; heat until hot. Beat baking mix, milk and eggs with a hand beater or whip until smooth. For each crepe pour 2-3 Tablespoons batter into the skillet and rotate until the batter covers the bottom. Cook until golden brown. Gently loosen edge with spatula, turn and cook other side until golden brown. Stack placing waxed paper between each; keep covered to prevent them from drying out. Mix 1 cup sour cream with 1/4 cup brown sugar. Hull and slice 1-2 pints fresh strawberries. Place 1 Tablespoon sour cream mixture across center of each crepe. Sprinkle with sliced berries. Roll and place on plate or serving platter. Repeat; Top with additional sour cream and berries. Enjoy! For the crepes, I combined 1 cup Bisquick mix with 3/4 cups of milk and 2 eggs. I use my favorite non stick pan. As I pour in the batter I rotate the pan so it is as thin as possible. I did add about 2 Tbps of milk in addition to the milk to make the batter a little thinner. This helps the crepes to be very thin. I have the sour cream and brown sugar mixture close at hand to fill the crepes. As I finish cooking the crepes I put them directly on the plates for serving, I find this slightly easier to assemble and then later I do not need to transfer them from a platter. While the next crepe is cooking I assemble the crepe and roll it and keep an eye on the crepe that is cooking so it does not overcook. I put about 1 Tablespoon of the sour cream and sugar mixture down the middle of the crepe. I roll up the crepe and place it to the side of the plate so I make room for the other 2 crepes. After the crepes are finished I drizzle more sour cream sauce over the top of the crepes and add some more strawberries. Set the plate aside while you finish the other three servings and present your loved ones with a treat that will keep their bellies smiling for a few hours. This makes a great dessert for special guests, or a great brunch treat. I did once make these for a gathering of 20 people, but my back actually started hurting from making the crepes. I would double this recipe, but making crepes one at a time for a larger group is not something I will do again. Categories: Breakfast, Dessert - Fruit, Desserts, Favorite, Fruit | Tags: Bisquick Mix, Food, Recipe, Sour Cream Sauce, strawberries, Strawberry Crepes, Valentines Day | Permalink. You can easily add your own choice of filling. For my husband and myself we add artichoke hearts and mushrooms… play away to your heart’s desire. The dough recipe was from a Betty Crocker Cookbook and I have made it so often now that it is fully memorized. Yes, it is good and don’t be intimidated by making your own dough, it is easy to do and if you have a Kitchen Aid Mixer with a dough hook, just put it all in there and knead it. Easy easy easy! Dough preparation: Disolve yeast in warm water. Add sugar, oil, salt and 1 cup of flour. Mix together well. Add flour ½ cup at a time to make a nice dough. Knead the dough until smooth and elastic. Put in a greased bowl and cover; allow to rise about 20 minutes. Divide into six equal portions and roll out into 7 inch circle on a lightly floured board.. Mix tomato sauce, mushrooms, basil, oregano, garlic, and olives together and spread over half of each circle within one inch of the edge. Top with pepperoni, green peppers and cheese. Carefully fold dough over filling and pinch edges to seal securely. Place on a greased cookie sheet and allow to rest about 15 minutes.Brush with beaten egg to give dough a nice sheen. Bake in 375° F oven for 20-25 minutes. Enjoy! 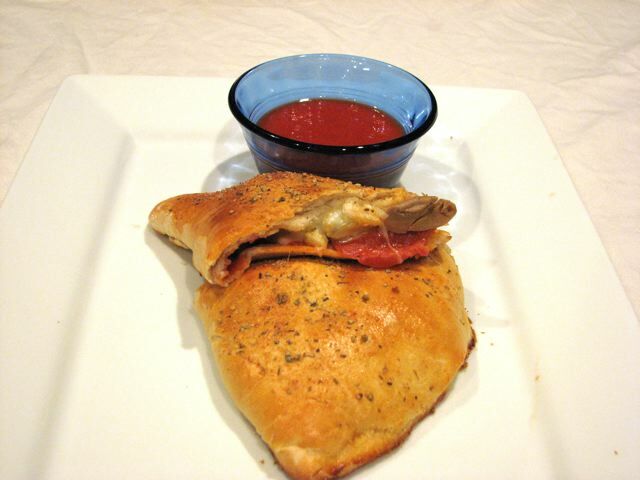 Categories: Baking - Bread, Ethnic, Ethnic - Italian, Favorite, Main Dish, Main Dish - Pork | Tags: Calzones, Food, Homemade Calzones, Homemade dough, Homemade Pizza Dough, Italian Food, Pepperoni Calzones, Recipe | Permalink. I originally found a recipe in “Taste of Home” Magazine that was an Italian Pasta, but I accidentally heated it up the first time I made and we discovered we loved it that way. Plus it had grated carrots in the original and we didn’t like it.. so a few changes later it is mine! In a 13x9x2 inch baking dish combine first 7 ingredients. Add cooked tortellini pasta and toss to coat. Sprinkle with Parmesan cheese, cover with foil and heat at 325° F for 30 minutes. 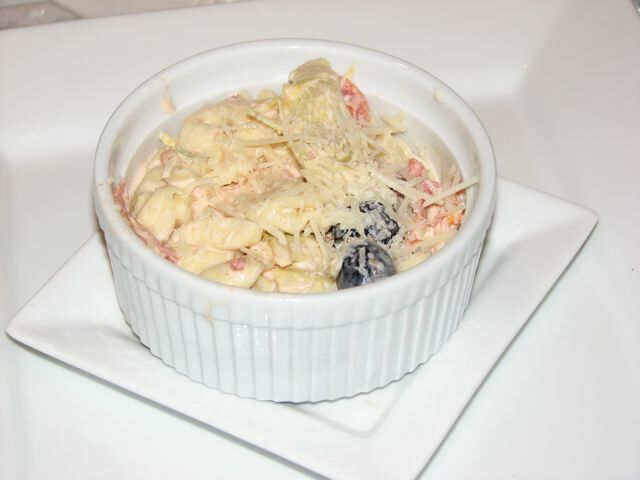 Categories: Ethnic, Ethnic - Italian, Favorite, Side Dish - Pasta, Side Dish - Salad, Side Dishes, Top Picks | Tags: Artichokes, Food, Italian Pasta Salad, Pasta Salad, Recipe, Warm | Permalink.